The past week found me outside more than at the computer or the kitchen sink! The weather has been perfect, cool, breezy, highs in the mid-70’s, sunny, and inviting. A few years ago my husband built the most amazing outdoor paradise for us…a large, two-level deck that has a beautiful wild cherry tree growing up through the middle of it. My gardening is done in pots, which I must say allows for perfect weed control, and so I have been busy hanging baskets and filling pots with ferns, petunias, verbena, daisies, marigolds, and some tiny, beautiful white wisps with an exotic name I don’t recall. The boys gave me a Frank Lloyd Wright-esque fountain that now sits on the upper deck and at night I like to light candles and relax to the trickling of the water. Who needs an expensive vacation? Clay has been working about 30 extra hours a week this month and the schedule will last into June as the power plant maintenance continues. I have been using the extra time to sew a rag doll for my granddaughter who will turn 4 soon and to bake special goodies for Clay’s lunch box. I am missing a family reunion with my three older children and all the grandchildren so I must be content to nurture a husband, teenage boys, and green things, I suppose! 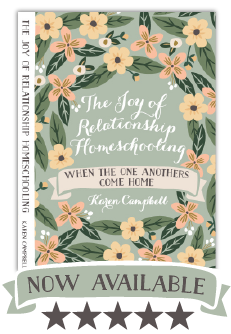 I came across several good articles I wanted to be sure to share, each of them having some implication for the topic of spiritual abuse and homeschooling moms. Sandy discusses the fact that we are all part of a royal priesthood. Lin has a series of thought-provoking posts on the servant hood of elders. (Be sure to read the intro and all four parts!) And Cindy has been reading about Jewish tradition in courtship and marriage and showing the contrast between genuine Hebrew tradition and what is passed off as such among the patriocentrists. All interesting and enlightening! Finally, I thought you all might enjoy a couple of the recipes I baked and froze last week to send with my husband. These are both from Paula Deen so you know they are delicious. Preheat oven to 350 degrees. Line 13 X 9 pan with foil and lightly grease. Combine milk and caramels in bowl and microwave until melted, stirring well. Combine oats, flour, brown sugar, and soda. Cut in butter until mixture is crumbly. Press half of oat mixture into the pan and bake for 20 minutes. Allow to cool for 5 minutes. Sprinkle white chocolate morsels and cashews evenly over crust, drizzle with caramel, and sprinkle remaining crust over top. Bake 20 more minutes. Allow to cool completely and cut into squares. Prepare frosting and keep warm. Toast pecans by placing in single layer on a cookie sheet and putting in a 350 degree oven for 6-8 minutes. In saucepan, melt butter over medium heat. Combine next four ingredients, whisking until it comes to a boil. Remove from heat and add vanilla. In bowl, combine sugar, flour and soda. Stir in cocoa mixture and pour into greased 15 X 11 jelly roll pan or small cookie sheet that has edges. Bake for 20 minutes. Immediately sprinkle marshmallows and pecans evenly over hot cake. Pour frosting over all and allow to cool. In saucepan, melt butter over medium heat. Whisk in milk, cocoa, and vanilla. Bring to boil, whisking constantly. Remove from heat. Whisk in powdered sugar until smooth. i’m missing a lot of the reunion, too, since they’re 30 minutes away most of the time. much of the reunion fun happens after bedtime for the kids, you know…. i must make those caramel bars . . .